MUDRAS…..The power is in our hands: Mudras are yoga movements that are performed with the arms and hands. They are extremely simple, but so powerful that they will transform your life. How? Simply releasing the blocked energy inside your body in the energy channels called nadis and in the energy centers called chakras. By arranging and directing this energy through the mudras, you can achieve your goals and have the ability to solve the problems of daily life. Hypertension or high blood pressure is a common clinical presentation worldwide. High blood pressure control is important to reduce many disease complications such as kidney failure, heart diseases and stroke. Apart from medications, yoga Hand Mudra ia an effective supplement to medical healing clinical conditions like blood pressure, asthma, stress,obesity and heart diseases. This mudra is known as the mudra of energy. It helps the body eliminate toxins and treats bladder problems. With both hands: join the yolks of the thumb, the ring finger and the middle finger, while the other fingers remain extended. Practice as needed, from 5 to 45 minutes, or as a cure 3 times a day for 15 minutes. The Apan Mudra exerts a balancing effect on the state of mind, which depends on a liver that works well. It grants patience, serenity, confidence, inner balance and harmony. In the mental sphere, it generates the ability to develop visions. All this is necessary when looking to the future, when we have to face new challenges and when we want our wishes to be fulfilled. It reduces heart problems and regularizes palpitations. It is used as first aid for a heart attack, when it is done in the first couple of minutes. It keeps blood pressure under control. It regulates intestinal transit and eliminates constipation. Mudra di Garuda activates the circulation and the flow of blood. It also helps to relieve fatigue. First place your hands, right to left, engarzadas from the thumbs on the belly. About 10 respiratory movements remain. Then place on your stomach and still remains … Finally place your left hand on the breastbone, turn your hands over your fingers on the shoulders and opens. You can go as you need it or 3 times a day for 4 minutes. Garuda, the king of the birds, the air, the enemy of snakes and mount of Vishnu is an animal full of strength and power. Generally, birds have a very acute sight, a great sense of direction and a huge survival instinct. And the largest, thanks to its enormous size and strength in the wings, can be carried away from the air.
. This mudra activates irrigation and blood circulation, revitalizes the body and rebalances the energies of the two halves of the body. If in the pelvis or chest area, it revitalizes and stimulates. It relaxes and softens the pain and disorders of the menstrual cycle, discomfort in stomach difficulties and breathing. If you suffer from hypertension seen with care. It also helps with exhaustion and mood fluctuations. the tip of the ring finger touches the base of the thumb, which exerts a slight pressure on the ring finger. Benefits: increases the production of body heat, is useful in overweight, helps digestion, reduces cholesterol. 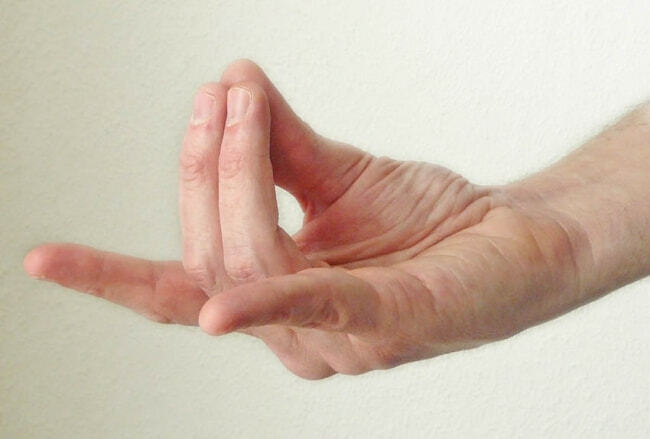 Precautions: Weak people should not perform this mudra when it is hot. the tip of the thumb, ring finger and little finger touch each other, while the other fingers are stretched. Benefits: awakens the power of prana, is useful in diseases of the eye and improves the sight, increases the body’s resistance to diseases, removes tiredness. During fasting it reduces hunger pangs. In case of insomnia, together with Gyan Mudra, it helps to get to sleep. : it is a combination of Apan Mudra and Vayu Mudra. The tip of the thumb, of the middle and of the ring finger touch each other, while the index finger touches the base of the thumb with slight pressure. The little finger is tense. Benefits: gives the benefits of Vayu and Apan Mudra. In particular it is useful in heart disease and those who have had a heart attack should do it every day. If it is done 5 minutes before climbing stairs, it helps in the effort. Regular exercise is the best ways to lower blood pressure; Fast walking, jogging, swimming, and athletics are good options. But, most important, don’t forget that Laughter is the best solution. It relieves the stress and anxiety that is the primary cause of high blood pressure in today’s lifetime… being worried is so useless…. keep smiling! What is the Difference Between Vinyasa and Ashtanga yoga ? What is the Difference Between Vinyasa and Ashtanga yoga ? : When we talk about Yoga, the term goes beyond only physical exercise as it is known in western countries. There are different branches that support and rich the whole discipline to eventually become a lifestyle when one deepens into it. Ashtanga and Vinyasa are two styles of yoga asana which have specific characteristics according to their purpose and philosophy. What’s the meaning of “Ashtanga”? The word Ashtanga itself means “the eight limbs (branches) of yoga which according to the ancient knowledge are: Yama, Niyama, Pranayama, Asana, Pratyahara, Dharana and Samadhi. Pattabhi Jois and T. Krishnamacharya established Ashtanga Yoga in Mysore (South India) in the 20th century. These branches are meant to expand the whole discipline into other fields to learn different techniques to control your breathing and vital energy, to improve your concentration and knowledge, to have a better control of your senses, to learn different methods of inner and outer purification and of course to balance the mind within the physical body: yoga asana. Ashtanga yoga is a dynamic, flowing style that connects the movement of the body with a specific technique of breath called “uyai ”. The importance of this yoga asana practice relies on the daily practice of a sequence series of postures. According to the progress of the yoga practitioner, there are six series of Ashtanga yoga sequences where the level of the asanas as well as the level of concentration in the mind increase. Ashtanga yoga classes are often taught in the “Mysore style” where the students have to memorize each asana sequence, develop it individually, but setting the energy together and get adjustments from the teacher supporting the class. They should master each posture in the sequence they are working before they move on to the next. What is Vinyasa yoga flow? The term Vinyasa refers to connects the breathing system with every movement in the series. Vinyasa is also the term used to describe a specific sequence of poses (Chaturanga to Upward-Facing Dog to Downward-Facing Dog ) commonly used throughout a vinyasa class. In a Vinyasa practice, the student is led by the teacher who will create a different class every time to develop the certain number of asanas and go with dynamic flow and increase the level of the postures with the support of some elements such as props, music, some variations according to the student, etcétera. The sequencing: Ashtanga Yoga consists of a series of postures: primary, secondary, and advanced. On the other side, Vinyasa class sequences vary, the practitioner might change a sequence each time. 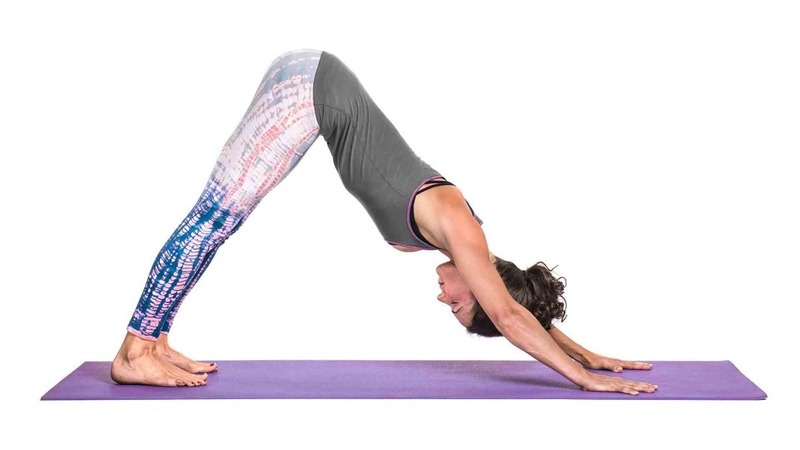 Each Ashtanga series includes a category of asanas: the primary series centers on forwarding bend, the second series focuses on backbends, and the advanced series emphasizes arm-support and arm-balancing poses. Vinyasa Yoga sequences, on the other hand, often feature a peak pose, chosen by the Teacher according to the level of the student class. The main development of the Ashtanga practice is up to the student with the Mysore style class mentioned above, while in the Vinyasa class, the teacher always leads the class through the asanas. Practitioners of Ashtanga Yoga do not use props, posture modifications, or music. In Vinyasa classes, some teachers make props available to adapt and adjust to some asanas if it is needed. It would be a good idea to do some research and also to try a couple of classes to feel yourself and decide which one is the more suitable for you according to your lifestyle, personality, energy, and physical constitution. 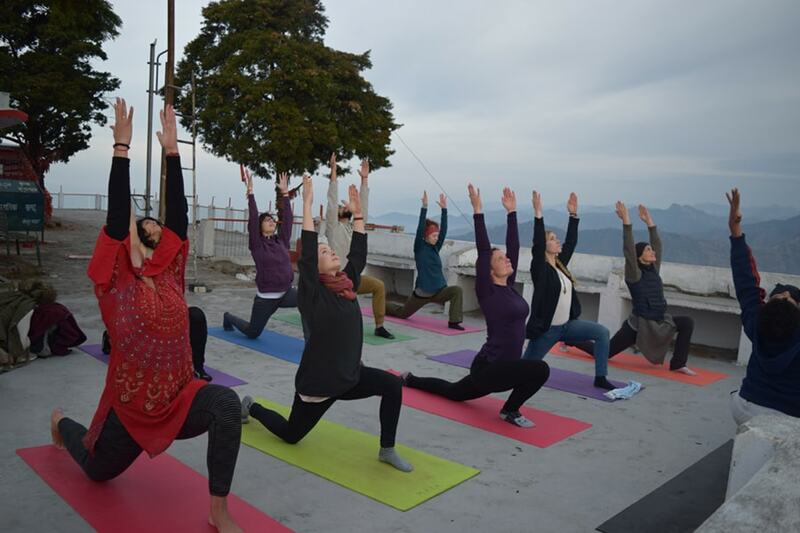 Warm up for Advanced Yoga Poses: Yoga tradition in India is an ancient discipline that focuses into the balance between body and mind developing also the emotional and spiritual subtle bodies. Yoga shows us how to connect with our physical body and to make ourselves aware about the different functions it realize to transform the energy inside, such as respirate, digest, assimilate and excrete substances. In the same way, it takes a very important part within the nervous, glandular, reproductive systems in our body. In yoga philosophy, it is applied the term ahimsa that refers to the ‘non violence’ towards us and also to our context; therefor in the moment of the warm up, this understanding leads us to take care of our body, to feel and listen to it and to take it slowly to the movement and eventually to perform the final pose. In second place, the importance of the warm up relies in the prevention of injuries, because if we take care of the body, it will react in a more positive way for the rest of our yoga practice. The movement starts from the joints in order to lubricate them: ankles, knees, hips, shoulders, elbows, wrists, fingers, toes, neck. Afterwards it is recommended to speed up the heart bit with some deeper exercises to increase the body temperature. Finally it is appropriated to do some stretching exercises all over the body, mainly in the biggest muscles in order to prepare it for a practice that is demanding a longer duration, movement, resistance, strength. If within your yoga practice there are included some asanas that requires a higher level of strength, balance or to be held for a longer period of time, there are few recommendations: Sun salutation is a very complete series of asanas, since it warms up every muscle in our body from feet to head, it also goes gentle with the body so they awake gradually, and at the same time it becomes intense so it activates biggest muscle groups such as the abdomen, buttocks, ties to give a strong support for the rest of the body. A good Warm up for Advanced Yoga Poses besides preparing the body to do a nice yoga practice, one can avoid overcharging and harming the body. It is essential to give the gap and time to prepare the body with a good warm up so we can elongate his well functioning through a healthy way. How to Use Yoga for Shoulder Pain, Stretches for shoulder pain: Yoga is an ancient practice whose objective is to take the human body to a state of balance. Within the human body there are also other subtle energies such as the mental body, the emotional and the spiritual body. In our daily life, in our every day activities. we focus mainly into the physical body only. 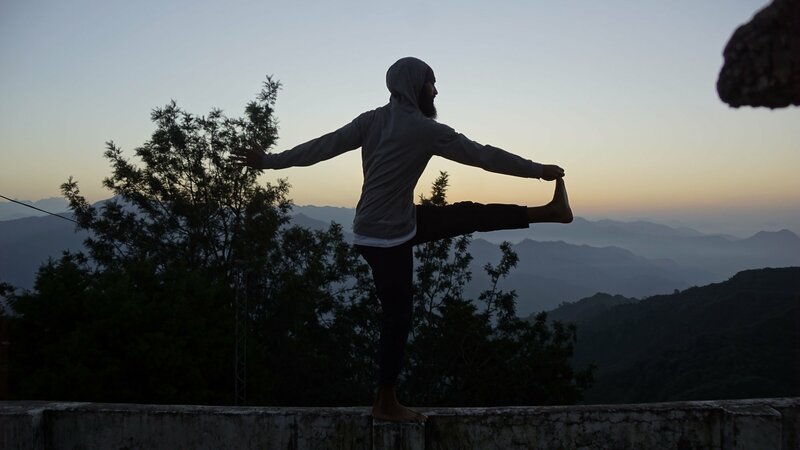 Yoga makes special emphasis to connect with our five senses and develop the capacity of becoming more sensitive about them in order to touch these subtle energies that are flowing within us. It is known that every part of the physical body is related with some emotional memories from the past, and that our subconscious body is wiser than our intellectual body and thus it is reflecting through the physical body some sore, pain, or even some decease in order to alert us that something in our emotional or mental level is unbalanced. Within the psyche science, shoulders in our body represent the capacity of holding an emotional weight, either happiness, sadness, fear or anger whether it is under our control or not. We might feel unbalanced whenever we have the sensation that we still have too many of goals to accomplish and it might be too intense to complete them , or even to feel non satisfied about it. Also when we are experiencing certain insecurities either emotional or material, shoulders might tend to tense. In the moment of tension, they are also contracting and therefor closing up. This connotation of closing implies also blockage to communication with ourselves and with the environment. As a consequence , shoulders might block the openness with the heart because it rests between both shoulders and, and this tension would be blocking as well the natural flow with the rest of our body. Asanas in Yoga promote the openness of the distance between the shoulders and the ears, they are improving the functions of the respiration system. All this will generate a release of this tension and also a decrease of the pain on this area as well as in the neck and in the upper back. Garudasana (eagle pose). This asana will stretch the dorsal area and the arm muscles. Ardha Uttanasana (half standing forward bend pose). This posture benefits the stretching of the frontal torso as well as the strengthening of the back muscles, creating distance between the shoulder and the ears. Gomukasana (cow pose). It helps to expand the chest improving the heart functions, it also optimizes the openness of the shoulders and the elongation of the upper part of the back. Adomukhasvanasana (downward facing dog). The appropriated performance of this pose benefits the openness of the shoulders, armpits, and chest as well as the elongation of the spine. Pendant pose. The benefits of this asana are: to release tension on the lateral muscles of the neck. Parenting in today’s world is full of challenges. It’s not uncommon for parents to feel overwhelmed by their busy schedules and seemingly endless responsibilities. But, it is uncommon for us to think about how the demands of parenthood may also be overwhelming for our children. Our little people are strong and resilient, but they are often influenced by stressful situations just as much as big people. Many adults practice yoga for stress release and relaxation. 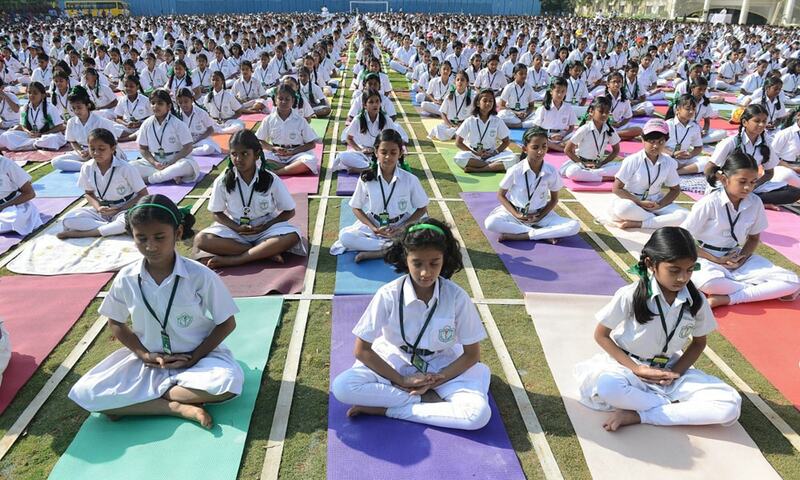 Is it possible yoga could benefit our youth too? The answer to that question is: ABSOLUTELY. Introducing children to yoga is not only valuable for relaxation, it is valuable for sharing knowledge, building confidence, and developing communication skills. Many Asanas (yoga postures) were named after animals and plants because they were created by yogis who lived close to nature. When children practice these asanas they will use their imagination as they embody the movements of a cobra or a butterfly, and sharpen basic skills as they count to ten while standing tall and strong like a tree. As a form of exercise, yoga is good for building coordination, flexibility and strength. What separates yoga from youth sports and other goal oriented physical activities is that it is noncompetitive. This creates a space for a child to experience control over their physical being and develop body awareness without any feelings of judgement or comparison. Children may not be able to understand the complex and dynamic systems of human anatomy but they can experience their brain communicating with their body through yoga. As they alternate between Cat and Cow, they will be actively listening to, and speaking with, their bodies. After completion they will be able to talk about the different physical sensations they felt, adding an opportunity for them to verbalize the connection between their mind and body. In addition to all the benefits mentioned above, let’s not forget that yoga is really fun. Kids deserve time to play and let’s be honest, a yoga mat is a playground. So next time you’re looking for something to do with your kids, drop down into Lion’s Pose, stick out your tongue, and let out a roar. Your pride will have some happy cubs. Because Yoga is a whole life journey and also a discipline, it is not only about performing asanas or postures. The full Yoga practice is a concept which the goal is the purification of the body and mind in parallel. Such purification brings us harmonic balance including all the activities in our life; from the well functioning of the systems within our body to a deeper understanding of the our mind to create more space and experience mental peace, tranquility, then more genuine and long term happiness. To have a good rest is vital in order to wake up fresh on the next morning and regenerate our body so we can invest the energy we accumulated to do our yoga practice. In order to have a quality rest time, it is essential in the first place to make some gap in our mind, emotions and consciousness by the moment we go to sleep. It is likely that the mind would stay sharp and clear even by the moment we wake up. As well as it is recommended to make some space in the mind in the moment we go to sleep by keeping aside certain worries, avoiding the contact with the phone and similar devices, it is also essential to have some space in the stomach, in other words it is important to have an early and light dinner that would be easier to digest. The purpose of these cleansing exercises, according to the nature of our body, is to help with the elimination of the toxins. Neti: It implies different kinds of nasal cleansing. Dhauti: A method to clean the upper digestive system. Nauli: It is the strengthening of the abdomen as well as the purification of the digestive system. Kapalabhati: The cleansing of the respiratory system: from the nasal cavities to the lungs lungs, as well as mental impurities. Trataka: A mind purifying technique through the sense of sight using the flame of a candle. Such cleansing or purification get a stronger effect on the body if we apply them on an empty stomach as well as our yoga asana practice, if we have to do it early morning. Otherwise it is better to leave a gap of three to four hours after having meals. Since all yoga practices lead to the path of liberation through the philosophic principles such as respect, solidarity and devotion, in the asana practice it is applied as the term ‘Ahimsa’ (nonviolence), to establish a relationship with our body with the purpose of having a deeper understanding according to what it needs for maintaining the harmony within. To be aware of certain physical limitations or injuries, it is necessary to warm the body up previously to the performance of the asanas, as well as increasing the capacity to be able to perform more advanced ones. Before the practice it is very important to let go any thought from the past or the future, so we can connect with the present moment and link with our body. When we are linked with our body, we can deepen our yoga practice by connecting to the breath with every posture, which means that we are able to unify the inhalation- exhalation when we enter to the posture, when we are in the posture itself and finally on the way out of it. These are some tips that will do of your yoga Asana practice, a conscious activity, and therefore your will be able to notice the benefits within your body and the mind.